One involves my Spanish host mom, and the other involves a frittata pan. (Trust me, it will all make sense in a minute). When I lived in Barcelona back in 2002, I fell in love with tapas. I was enamored with the idea of standing around a bar with friends, eating small bites and drinking wine. One of my favorites was "tortilla espanola." This is not a Mexican tortilla that you eat with tacos. 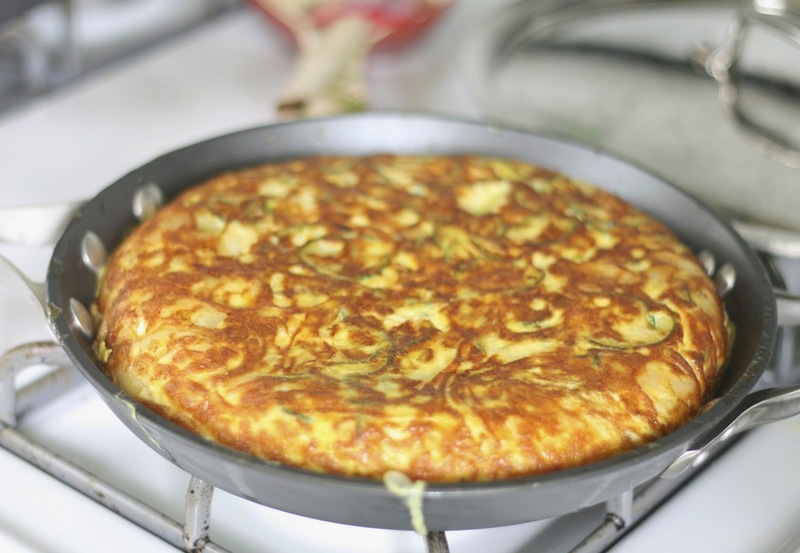 In Spain, tortilla is an egg dish. It's more of a Spanish omelette that is often served room temperature as a snack (or tapa). My host mom, Dolores Berga, often made variations of this for dinner, and just like her potaje, I took careful notes so that I could recreate it back in the states. 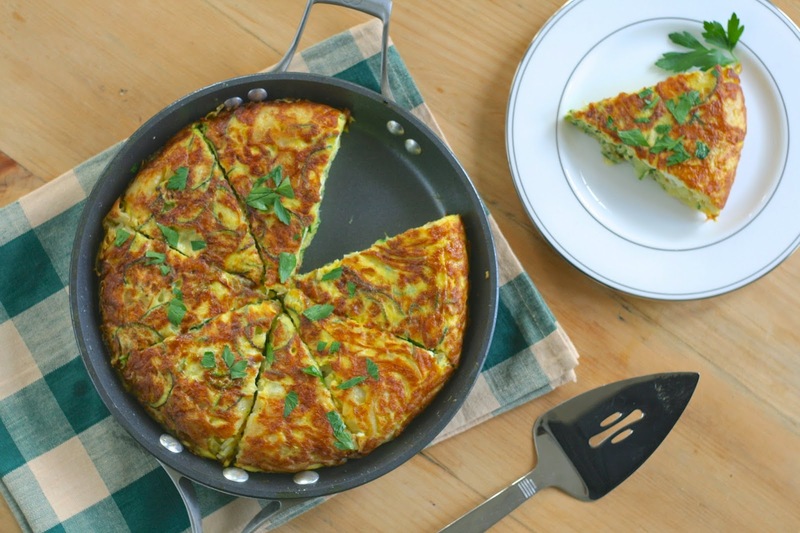 I loved it so much, that when I spied a special frittata pan at Williams Sonoma several years ago, I purchased it specifically for making tortilla. (Also, I'm addicted to kitchen gadgets, but that's another story). However, the pan is so versatile, I used it for making other things, including eggs almost every day. I was unaware that you're NOT supposed to use non-stick spray on these non-stick pans. And yet I did. Every. Single. Day. Apparently it makes them lose the non-stick qualities after time (I feel silly for not knowing this). So, after six years, I finally came to this realization when my eggs began sticking regardless of the amount of oil or spray I used. It was a sad day. Needless to say, I decided to purchase a brand new set of frittata pans. And it only seemed fitting that I break them in with Dolores' tortilla espanola recipe. 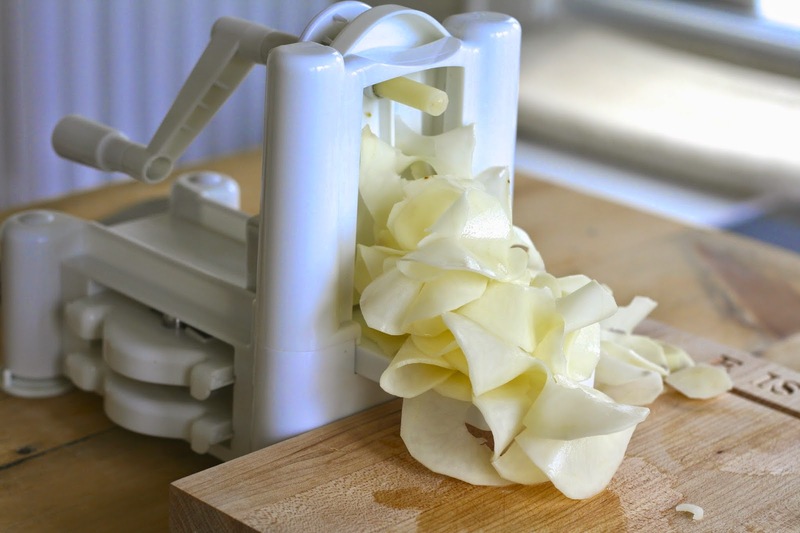 Normally, you would simply use a mandoline to achieve super thin slices of the potatoes. I decided to try out my spiralizer for this job (see above comment regarding kitchen gadgets), and it worked awesome! It made the process go by super quick. (If you are using a mandoline, slice to 1/8" thickness). Sprinkle potatoes with salt and toss to distribute, then set aside. It's also important to note, this recipe would normally call for at least 3 large potatoes, and up to 5. To cut down on the carbs, I only used one and filled with thinly sliced zucchini to make this more of a "skinny tortilla," but to make it more traditional, feel free to add more. (The fewer potatoes also reduces the amount of oil needed, so this also cut the fat content considerably). While you are slicing the potatoes, heat a little less than 1/2 cup olive oil on medium high in a 10-inch skillet that's at least 1½ inches deep (a non-stick pan will work best). (You will need considerably more oil if you are using more potatoes). 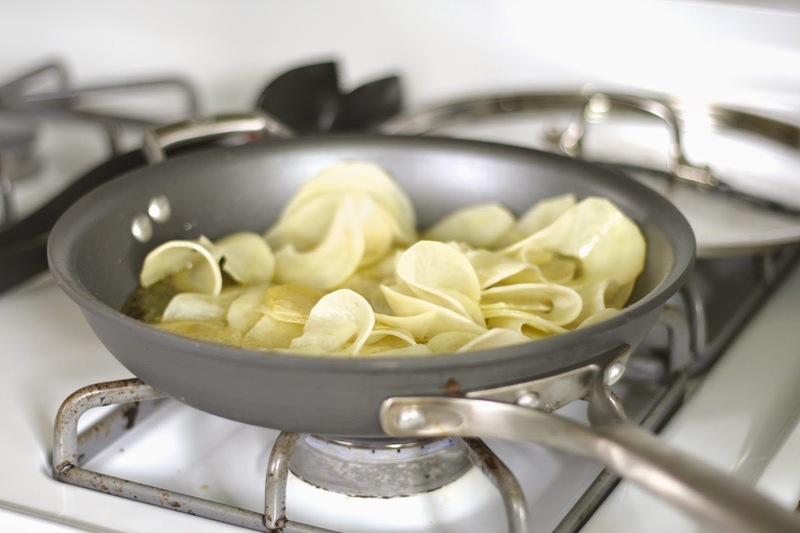 When the oil is very hot (a potato slice will sizzle vigorously around the edges without browning), gently slip the potatoes into the oil with a skimmer or slotted spoon. Fry the potatoes, turning occasionally (trying not to break them) and adjusting the heat so they sizzle but don't crisp or brown. Set a sieve over a bowl or else line a plate with paper towels. When the potatoes are tender, after 10 to 12 minutes, transfer them with the skimmer to the sieve or lined plate. The most basic of tortillas only uses potatoes, onion and egg. But Dolores always added zucchini to hers, so I like to do so as well. And as I mentioned above, this was dual purpose as I used it to help take the place of some of the potatoes to make it a little healthier and lower in carbs. Slice two large zucchinis (about 235 grams each) in the same way you did the potatoes (either with a mandoline or spiralizer) and season with salt. 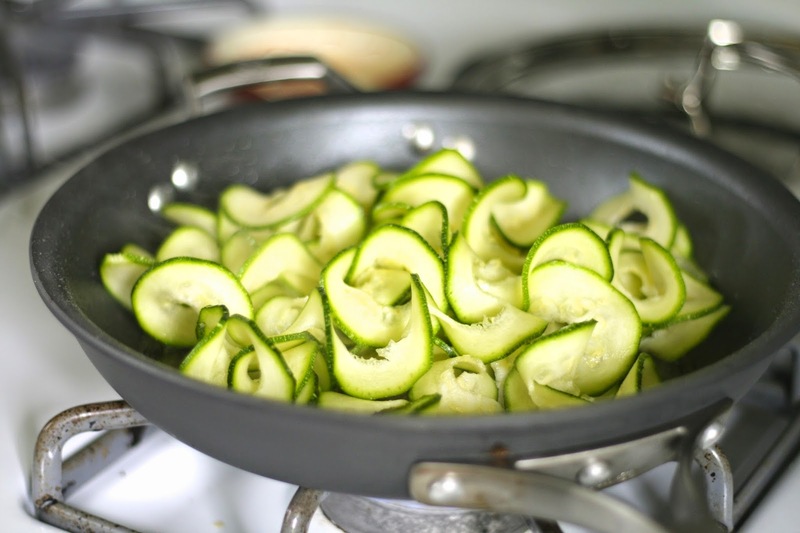 Using the remaining oil left over from the potatoes, cook the zucchini at a slightly lower heat (around medium). Cook until tender, about 4-5 minutes. Remove to the sieve or lined plate. Finally, sauté chopped onions and garlic in the remaining oil until soft and translucent. Wipe out the pan and heat the on medium high. Add 2-3 more teaspoons of olive oil. Let the pan and oil get very hot (important so the eggs don't stick), and then pour in the potato and egg mixture, spreading it evenly. Cook for 1 minute and then lower the heat to medium low, cooking until the eggs are completely set at the edges, halfway set in the center, and the tortilla easily slips around in the pan when you give it a shake, 8 to 10 minutes. 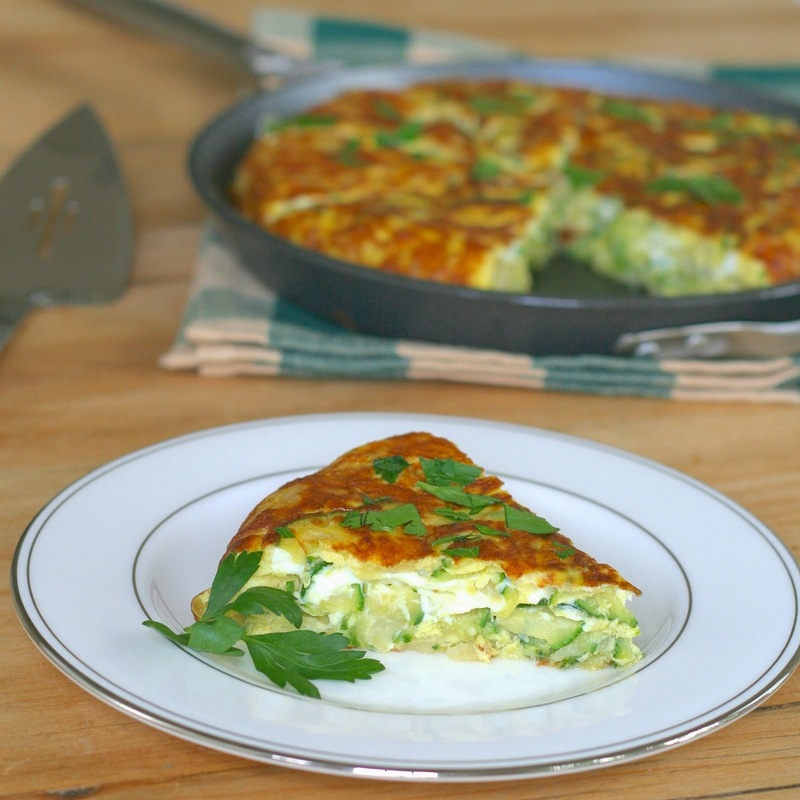 (You may need to nudge the tortilla loose with a knife or spatula). Now, if you have one of these super cool interlocking pans, you can simply heat another teaspoon of oil in the other one, lock them together and swiftly flip to cook the other side. (Like I did for my frittata post a couple years ago). However, Dolores did this countless times with simply a plate. To do so, set a flat, rimless plate that's at least as wide as the skillet upside down over the pan. Lift the skillet off the burner and, with one hand against the plate and the other holding the skillet's handle, swiftly invert the skillet so the tortilla lands on the plate (it should fall right out). Set the pan back on the heat and slide the tortilla into it, using a spatula to push any stray potatoes back in under the eggs as the tortilla slides off the plate. Once the tortilla is back in the pan, tuck the edges in and under itself (to neaten the sides). Cook until a skewer inserted into the center comes out clean, hot, and with no uncooked egg on it, another 5 to 6 minutes. Peel and slice potato to 1/8" thickness and season with 1 teaspoon salt. Heat about a 1/2 cup olive oil on medium high in a 10-inch skillet that's at least 1½ inches deep (a non-stick pan will work best). When the oil is very hot (a potato slice will sizzle vigorously around the edges without browning), gently slip the potatoes into the oil with a slotted spatula. Fry the potatoes, turning occasionally (trying not to break them) and adjusting the heat so they sizzle but don't crisp or brown. 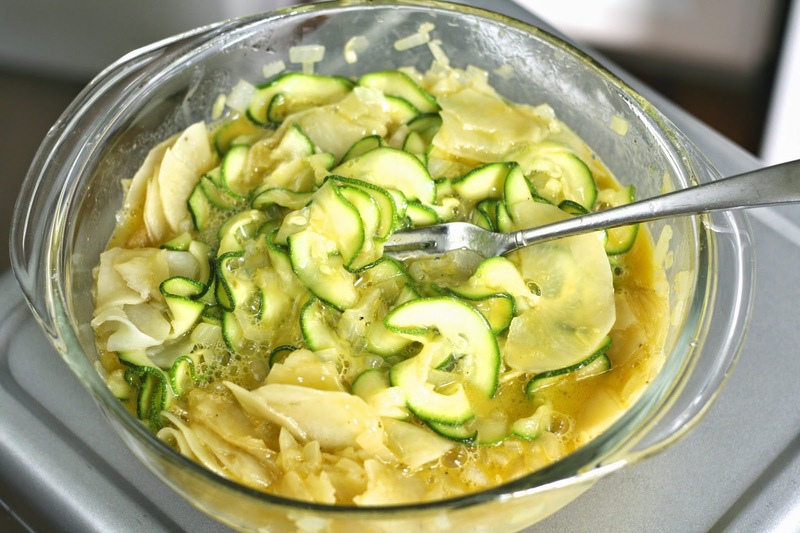 Slice two large zucchinis to 1/8" thickness and season with 1 teaspoon salt. 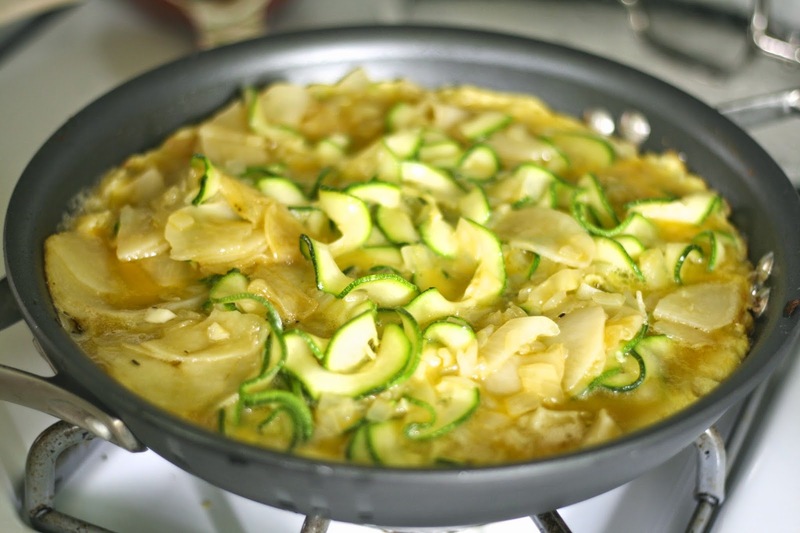 Using the remaining oil left over from the potatoes, cook the zucchini at a slightly lower heat (around medium). Cook until tender, about 4-5 minutes. Remove to the sieve or lined plate. Beat six eggs in a large bowl and season with remaining salt and pepper. Gently fold in the potatoes, zucchini, onion and garlic, trying not to break the potatoes (some will anyway). Wipe out the pan and heat the on medium high. Add 2-3 teaspoons more of olive oil. Let the pan and oil get very hot (important so the eggs don't stick), and then pour in the potato and egg mixture, spreading it evenly. Cook for 1 minute and then lower the heat to medium low, cooking until the eggs are completely set at the edges, halfway set in the center, and the tortilla easily slips around in the pan when you give it a shake, 8 to 10 minutes. (You may need to nudge the tortilla loose with a knife or spatula). Set a flat, rimless plate that's at least as wide as the skillet upside down over the pan. Lift the skillet off the burner and, with one hand against the plate and the other holding the skillet's handle, swiftly invert the skillet so the tortilla lands on the plate (it should fall right out). Set the pan back on the heat and slide the tortilla into it, using a spatula to push any stray potatoes back in under the eggs as the tortilla slides off the plate. Once the tortilla is back in the pan, tuck the edges in and under itself if necessary (to neaten the sides). Cook until a skewer inserted into the center comes out clean, hot, and with no uncooked egg on it, another 5 to 6 minutes. I learned this in a cooking class I took in Barcelona in 2012. Very minor difference from what you've shown, but same general thing. Back home, I've served it with a side of romesco (which a Spaniard probably wouldn't do), and that turned out pretty well. Jaymee, I LOVE this recipe! You were so lucky! My host family used to leave Sevilla every weekend and used to leave the three of us (exchange students) with one tortilla and a loaf of bread to split!